The Location. The breakfast is good. The staff from Vietnam called Jack is very helpful and polite. This hotel get higher mark because of him. Room is clean. Bed is comfortable. Staff is friendly. Room size was excellent, and staff very friendly and helpful with good English ability. variety in daily braeakfast. the porch where you can have 24 hours of flowing coffeee/tea and biscuits. Location and room size was great bathroom nice and large. Excellent breakfast. Mixed Taiwanese and West styles. ที่พักยอดนิยมแห่งหนึ่งของเราในไทเปHotel HD Palace offers rooms with free minibar items and free wired internet. Organic coffee can be enjoyed at the sky garden. The iconic Taipei 101 building and Tong Hua Night Market are just a 5-minute drive away. The spacious air-conditioned guestrooms are decorated with soothing earth tones. All come with a flat-screen TV, and ironing facilities. En suite bathrooms come with either a shower or a bathtub. Staffs who are well-versed in English can help to arrange day trips or meeting rooms. Surcharged underground parking is available, while designated smoking area is provided at the outdoor terrace. The hotel's restaurant serves a daily buffet breakfast. Complimentary tea, coffee and snacks are available for 24 hours in the lobby. Staff will happily provide tour arrangement advices to guests. Located in Taipei’s Da-An District, Hotel HD Palace is a 6-minute walk from Xinyi Anhe MRT Station and a 5-minute drive from the World Trade Centre. Taoyuan International Airport is a 50-minute drive away, while Songshan Airport is only a 10-minute drive away. ท่านต้องการเข้าพักที่ Hotel HD Palace เมื่อไร? Decorated in soothing earth tones, this modern air-conditioned room comes with a flat-screen TV. En suite bathroom has a bathtub. Please note there is no capacity for an extra bed in this room type. Spacious air-conditioned room comes with a L-shaped sofa and a flat-screen TV. The en suite bathroom has a Japanese-style bathtub. Decorated in soothing earth tones, this modern air-conditioned room comes with a flat-screen TV. 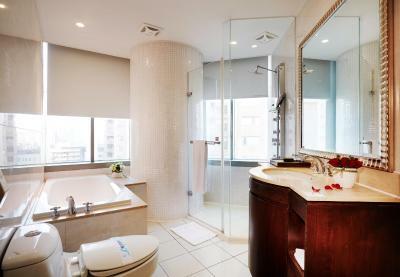 Offering views of Taipei 101 and Taipei City, this modern air-conditioned room is decorated in soothing earth tones. The room has a flat-screen TV and a private bathroom with a bathtub. Decorated in soothing earth tones, this modern air-conditioned room comes with a flat-screen TV. En suite bathroom has a shower. Rooms come with 2 single beds and an extra roll-away bed. สิ่งอำนวยความสะดวกของ Hotel HD Palace 8.0 คะแนนสำหรับสิ่งอำนวยความสะดวกชั้นเยี่ยม! ล็อบบี้บริเวณชั้น 2 มีบริการชา กาแฟและของว่างฟรีตลอด 24 ชม. สนามบินไทเป ซงซาน (TSA) 4 กม.